Do Natural Treatments Work (on my hives)? Do you ever wonder if the things we do to help the bees survive our climates and manipulations really work? I certainly do. I learn things from other beekeepers and through reading, then try out the ideas – sometimes they turn out to be “seemed a good idea at the time” failures, and other times they seem to work – but I don’t have any science behind the successes just observations. This year I had the opportunity to have a laboratory analyze the state of my hives before and after fall treatments. I run naturally treated, antibiotic-free hives. My bees are of mixed breeds, but all dark bees. I raise my own queens and purchase queens from select breeders. I believe in hybrid vigor. It works with dogs and goats, seems to work with bees. I feed essential oils twice a year. I use varroa and nosema “natural treatments” in the fall. Essential oils for three weeks in the fall (and three weeks in the spring). 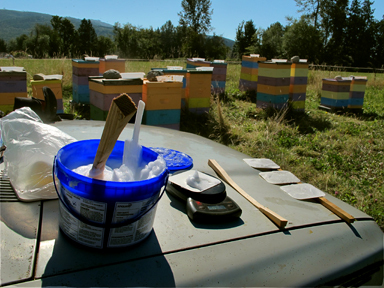 Nozevit – put into the bees feed, along with the essential oils. Apiguard (thymol) or Mite Away Quick Strips (formic acid). Each one is used on alternate years. I did one trail treatment for Varroa on four of the tested hives in July. I placed mites that eat mites in four of the hives : Stratiolaelaps scimitus (aka Hypoaspis). They seemed to do little. But I’ll cover the test and the results on the next post. All of the beekeepers who participated, were able to choose 8 hives from our apiaries, take monthly alcohol samples, and have those samples analyzed for Varroa and Nosema. The tests were conducted from June to November – I stopped in October because I don’t open my hives in November. My hives usually remain closed from October first until into the next year, but I really wanted to see the results of the tests before and after my treatments and fall manipulation, from pulling honey to gathering all the brood into a group. First I want to emphasize that these tests showed the results for 8 out of about 80 hives in a wet Northwest corner of Washington state. Every hive is different, and the differences increase by the type of bees in the hives (say Russians or Italians) to the location of the hives (believe me sunny Southern California is a universe away from Whatcom County, Washington). 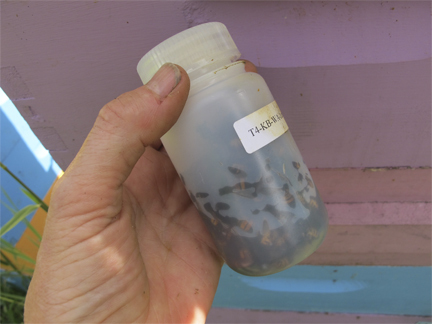 My bees are overachievers – they all scored quite high in Varroa and Nosema. Not quite where one wants one’s bees to score high. But they produced lots of good-looking bees, brood and honey… go figure. I’ll just highlight the highs and lows. The results were given in millions spores/bee. It sure looks like the hives get rid of the nosema without my help. Will I use Nozevit again – sure, I have a second bottle (an oops in the ordering). It seems to neither help nor hurt, so after that bottle, I will ponder its use. My bee conclusion: love those queens that are producing these bees. This is the one everyone wants to know about, eh? I tried Foundationless frames and half-Foundationless frames this year. The numbers below are in mites/100 bees. October(2 weeks post treatment) 7.79 1.53 3 below 2.5 4.13dramatic! No one hive stayed high or low. The hives fluctuated throughout the year. The one noticeable thing is the weather and season: Late August to Mid September the varroa numbers climbed high. Amusing note: looking back on my notes, I see where when I saw varroa during the test, the counts on those hives were low! Go figure. I am going to believe (back to that old “belief system” again) that the Thymol works too. The essential oils? Maybe they help. I’ll keep on doing them. 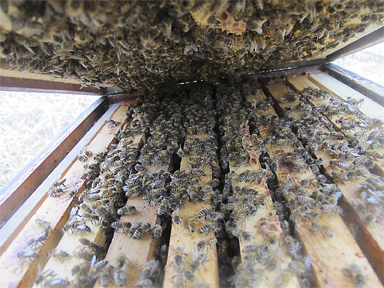 My bee conclusion: The ladies produced good brood and lots of honey, even with high numbers. So something is going right with their genetics – perhaps they can coexist with some varroa, or perhaps the workers just tidy up and the queen relay with rapidity. The eight hives tested, last seen in mid-October, and my other hives, which were last seen in mid-September, were doing fine. But winter and spring can be deadly, as we all know. If the weather permits, I will once again open these hives when it warms up a bit in February or March. I’ll let you know how they look then. Did you spot any interesting trends in the very abbreviated numbers I posted? Any thoughts on how bees can live and seemingly thrive with those high numbers of varroa? If so, write and share. 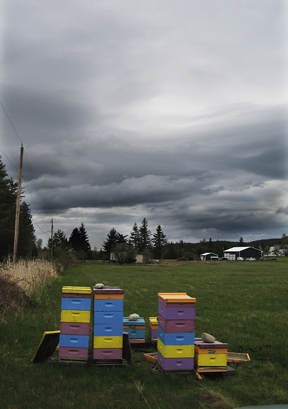 This entry was posted in Beekeeping, Brookfield Farm Bee Yards, Diseases and Pests, Feeding Bees and tagged bee, Brookfield Farm, health, honeybees, Maple Falls, natural, results, survey, tests, treatments, Washington. Bookmark the permalink.